Clayton Anderson spent 30 years with the National Aeronautics and Space Administration (NASA): 15 as an engineer and then 15 as a United States Astronaut. He retired in January of 2013 after flying two missions; one a long duration trip to the ISS of 152 days (up on STS117 and down with STS120) and one of 15 days with the crew of STS131. His spaceflight duration total includes 167 days in space along with 38 hours and 28 minutes of time outside the ISS spread over 6 spacewalks. 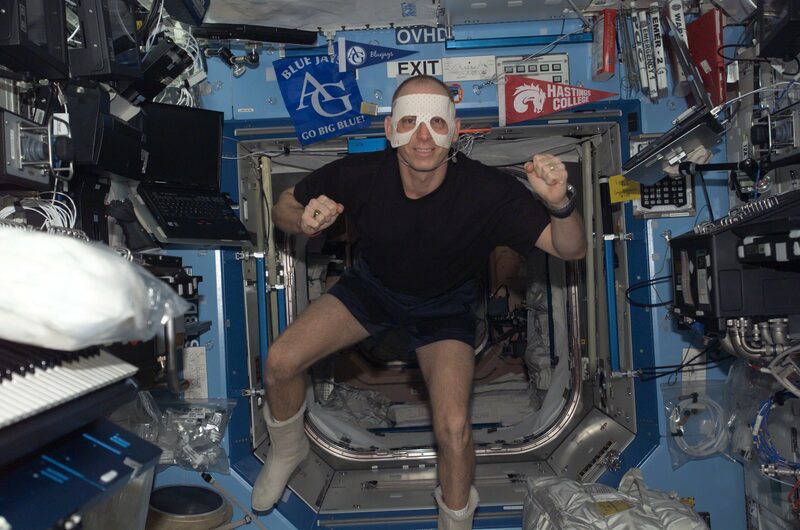 Selected as an astronaut in 1998, Anderson had applied 15 times over 15 years before his selection, giving him the unofficial record for astronaut rejection letters! In his retirement, Anderson serves as a motivational speaker and STEM Ambassador consultant, while continuing to serve as a Social Media Advocate, a NASA Supporter, and all-around good guy! 1. I read on Nebraska’s NPR site that, as a young boy, your mother covered you head-to-toe with aluminum foil to participate in a hometown parade as an astronaut. Was your education and early career always aimed towards NASA? I knew when I was 8 years old after watching the Apollo 8 astronauts fly behind the moon for the first time in history that I wanted to become an astronaut. My mother says we “discussed” it when I was 5-6 years old, and those discussions led to the aluminum foil costume in the parade. My dream did not really take on any hints of “reality” until I was in college, when circumstances led me to apply and be accepted for a summer internship with NASA at the Johnson Space Center in Houston, Texas. 2. After 152 days in space, how long did it take before you were walking around like an Earthling again? The first 24 hours were the most difficult. Our last day in space on STS120 was quite long. Then, once I returned to earth, I had several hours of “data collection” awaiting me as I was a guinea pig for several scientific investigations. The following morning though, after a solid night’s sleep and a good breakfast, I began to feel like normal. Each hour it got better and better, and after a two hour flight from Florida to Houston, I was feeling normal again. 3. How much spacewalking time have you logged? 38 hours and 28 minutes, ranking me about 28th on the current list of (Wikipedia) cumulative spacewalk records, with six spacewalks to my credit. 4. Were there any notable differences flying in the space shuttle Atlantis and the shuttle Discovery? Nope! The two vehicles are very similar. There is one locker door on Discovery that sticks once you get to zero gravity. It usually had to be closed and held shut with duct tape once in orbit! 5. What the heck is going on in this picture? Good story…TCDT (Terminal Countdown Demonstration Test) for the STS-131 mission. Crew goes to Florida 30 days prior to launch to check out their orbiter before it gets loaded…looking for computer cable/electrical cable routing, where equipment will be located, etc. I was asked if I wanted to crawl into compartment reserved for Lithium Hydroxide canisters (remove CO2 from Shuttle atmosphere) that was yet to be loaded. Of course, I said YES! My EVA partner Rick Mastracchio got his foot in the picture. 6. When you were on the ISS, what three things did you miss most about Earth? My wife and kids (that equals three!). If you make me count my family as a single entity, I missed being outdoors with all of its inherent smells and feels (wind blowing, sunshine, etc.). The third thing I missed was a medium rare, Nebraska corn fed T-Bone Steak with a loaded baked potato and a glass (or two!) of Silver Oak Cellars Cabernet Sauvignon! 7. What three things do you most miss about being in space? Zero Gravity, the beauty of seeing Earth from space and the sense of accomplishment that comes from achieving something that so few have ever been able to do. 8. Where did you meet your wife? What does she do at NASA? My wife Susan, is currently an education specialist within the NASA JSC Public Affairs Office. We met in the building 11 cafeteria at JSC. I followed (stalked?) her into the salad bar line, after watching her (I was stunned by her beauty) enter the building. 9. Where did you take your wife on your first date? She and I had dinner at Dong Ting’s (a restaurant in DT Houston that is no longer open) and then we went ballroom dancing… I can’t recall the name of the establishment where we danced, but there was a “Big (Dance) Band” there and we were, by far, the youngest couple in the room! 10. Which dance pro would be your ideal partner on Dancing With the Stars? Not sure…I think they’re all tremendously talented and absolutely gorgeous. I am sure some cold showers will be in order if I ever get to be on the show! Maybe Karina Smirnoff, as she is from the Ukraine. Perhaps we could converse in Russian! 11. What advantage would you have over some twenty-something pop or hip-hop star? Probably none. I am 54 years old, in pretty good shape and a former college athlete. Oh yeah, I am also an astronaut. Maybe living in zero gravity will give me an advantage. 12. In the current season of DWTS, who are you rooting for and who are you betting on? I love Bill Ingvall as a comedian and had the opportunity to meet him in 2010 as part of his Blue Collar Comedy tour. I think he has a great sense of humor and a wonderful personality. We also have the same taste in wines! 13. You list piano and vocal performance as some of your many skills. What’s your favorite performance piece? 14. Have fans ever confused you with Country Music singer Clayton Anderson? Yes they have…but I assume it’s because of the name only. Would love to sing with him sometime though. Not sure if I have a “country” voice, but perhaps we could do something interesting? 15. You and I were introduced by Dayna Steele. Did you know her first as a Houston rock DJ, or as the wife of NASA pilot Charles Justiz? When I first came to Houston, Dayna was a DJ on KLOL, Rock 101 in Houston. Every morning, on my drive to work, I would listen to that station and eventually became familiar with Dayna and her “Steelworkers.” I loved the “shock jock” persona and humor of the station more so than the music, but it made me laugh every day. As an astronaut, I was fortunate to meet Dr. Justiz (Charlie), who was an Instructor Pilot for astronauts learning how to fly the T-38 jets. Charlie and I flew together many times, and he was an excellent teacher, both in the jet and the classroom. He is extremely talented, just like Dayna and it’s also cool that our boys attended school together. Hurricane Ike was another of our “bonding” exercises, when my family went to their home to help them clean up. Charlie was on travel, so I played the part of the good doctor, ripping up their sheetrock, hauling garbage to the curb and giving Dayna a really hard time! They were actually two pieces of trash. During my first career spacewalk, I was tasked with “jettisoning” a stanchion (pole) support device and an ammonia tank that was no longer needed. The stanchion support was about the size of a large coffee table and the tank a double refrigerator/freezer. My spacewalking partner, Russian Fyodor Yurchikin, nicknamed them Nebraska One and Two, in honor of my home state, in which I take a tremendous amount of pride. 17. Looking at the USA from orbit, can you tell where Nebraska ends and Wyoming begins? What about the border between Nebraska and Iowa? The border between Nebraska and Iowa is easy –the Missouri River. Between Nebraska and Wyoming it’s a bit more difficult… they blend together beautifully! I just tell everyone that Wyoming and Iowa are better known as “far western” and “far eastern” Nebraska anyway! 18. What new path is taking you to Iowa? I am simply working for Iowa State University ¼ time as a “Senior Faculty Fellow” which means I am a member of their faculty and teaching a freshman aerospace engineering orientation class in the fall and spring semesters. I will commute from Houston to Ames at the appropriate times during the semester. A bunch of us young NASA engineers having some fun poking at what our bosses used to look like. Dave, Jerry, clay, Blair, Dave, Rick, Kevin, Rex to name a few. Many of them probably don’t want anyone to see that pic! 19. You have a memoir of your NASA days coming out in 2014. Is there a teaser you’d be willing to share? Folks can read a short excerpt from Chapter One, “First Flight” by visiting my website, www.astroclay.com. The book is currently titled “Takin’ Up Space!” Not sure when it will actually be published, but I’m hoping sooner than later. Not at all sure, but I know they would be welcomed in Texas if they’re packin’! This entry was posted in Uncategorized and tagged #DWTS, aluminum foil, Anderson, AstroClay, astronauts, Atlantis, ballroom, Bill Ingvall, Blue Collar Comedy Tour, Charles Justiz, Christian, Clayton, dancing, Dancing With the Stars, Dayna Steele, Discovery, Dong Ting's, Iowa, Karina Smirnoff, Lithium Hydroxide, memoir, music, NASA, NASA nerds, Nebraska, Nebraska One, Nebraska Two, nerds, Patrick Stewart, Penguin, Rick Mastracchio, satellites, space shuttle, spacewalk, stalker, STEM, Superman, Susan, Taking Up Space, Texas. Bookmark the permalink.